Tepig is a bright orange colour with brown and yellow on it’s head and brown on it’s lower half. It has a red snout and a brown spring tail with a red ball on the end. It has embroidered black and white eye detail on it’s face. 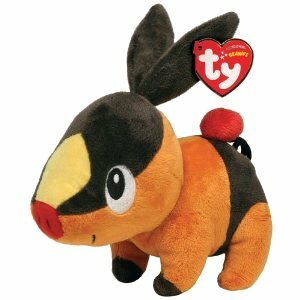 Tepig was released along with five other Pokemon Beanie Babies in October 2011, the others being Pikachu, Snivy, Oshawott, Axew and Pansage.